Why do users love Uber? Sometimes life presents the most interesting contradictions. Consider just one recent example of the meteoric rise of ridesharing leader, Uber. On one hand you have taxi companies, special interest groups and governments around the world seemingly doing everything they can to take Uber down. Yet, at the same time, users of the service simply love it. And the love just keeps growing stronger. Released earlier today, the Certify SpendSmart™ Q2 2015 report shows that Uber continues to take its share of the business traveler market away from taxis and other ground transportation providers. 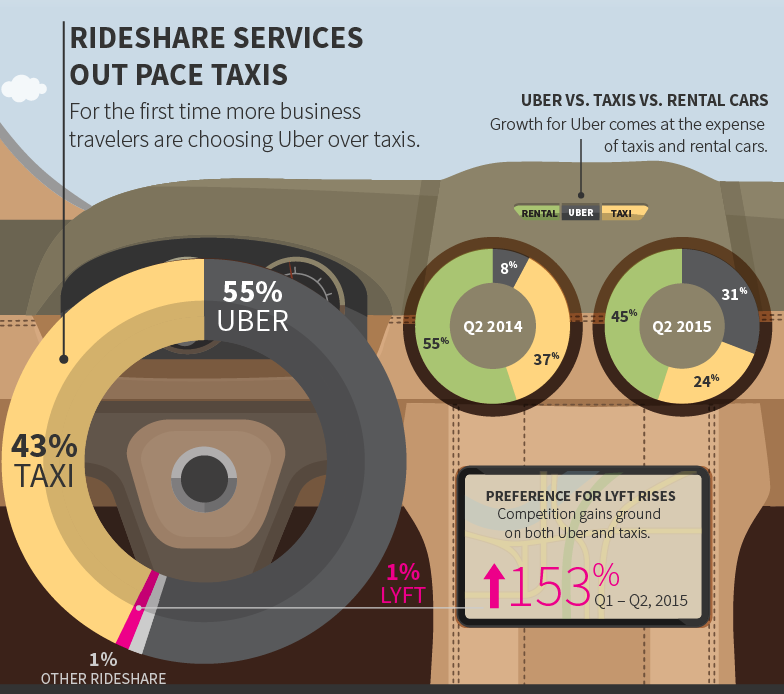 In fact, Uber now accounts for 55% of all rides compared to 43% for taxis. But why? With all the negativity and bad press these guys get, why are so many consumers, and now corporate travelers switching to and staying with Uber? Let’s explore a few possible reasons. For decades taxis have enjoyed a distinct advantage when it comes to convenience. Just call the concierge or step out on the curb to hail a cab, and you’ll soon arrive at your destination. Of course, you’re never quite sure if the car you’ll get accepts credit cards or cash only. Or, if the driver might have to rely on your sense of direction to get to somewhere that you’ve never been. So, the convenience comes with trade-offs, and that’s really where Uber and other ridesharing services offer a new competitive advantage. What’s more convenient than ordering a ride from your smartphone? Just a few taps on the app and you can choose the type of car, pick your destination and pay for it all electronically. Receipts, too. You can even choose your favorite driver. Perhaps in part because of these conveniences Uber is rated 4.59 out of 5 stars by Certify users compared to 3.7 stars for taxis overall. And rideshare competitor Lyft is rated highest with 4.89 stars. Consider also the number of times words like “easy,” “convenient” and “great” appear in Uber’s user reviews, and it’s no wonder taxis are starting to take the back seat. It’s fair to say that a cab is a cab is cab. At least in most U.S. cities, one taxi company is almost entirely indistinguishable from the next on just about every possible point of difference. Cars included. Catch a ride from Shutters in Santa Monica or from the Holiday Inn in Portland, Maine, and you’ll likely end up in a late model mid-sized American car. Which is just fine. But what if you’re traveling with clients and want to make an impression? Or, at least avoid a potentially awkward conversation about the odd smell emanating from your taxi? Whether you need a luxury car, SUV, carpool, one-way ride, or are simply looking for the cheapest way to get from A to B and back, Uber, Lyft and other similar ridesharing services put the power of choice in the palm of their users’ hands. The apps work like an à la carte menu of options with complete pricing transparency. Just tap, choose and go. Earned or unfair, taxis have a notorious and almost universal reputation for poor customer service. Whether it’s late pickup, getting the runaround on the shortest route or rough treatment from a driver whose been sitting in traffic all day, we’ve all had an experience with taxis that makes the stereotypes ring true. But that’s not the case with Uber. In fact, service and driver interaction are often cited as top reasons why users love Uber. Consider just two representative user reviews from Certify’s SpendSmart: “Great service! Easier, cleaner, and lower cost than a cab,” and; “The driver had me laughing the whole way there.” These two simple statements more or less sum up the competitive service advantage of ridesharing. When have you ever felt that way about a yellow cab? Let’s face it: anything that saves people money is destined for greatness. And if it’s something that can save businesses money, too, well, then success is all but guaranteed. Of course, that’s not always the case. However, when it comes to ridesharing and business travel, the allure of deep discounts on a basic necessity like ground transportation is proving to be too good to pass up. SpendSmart data showed that taxis were on average almost $4.50 higher per ride than Uber, and that doesn’t factor in any distinction for Uber’s more upscale services like UberBLACK or UberLUX. In addition to having a lower average cost, pricing on ridesharing services is completely transparent and provided upfront to users during the ordering process. The price you see is the price you pay, which means no more surprises for travelers or the accountants who process their expense reports. There are likely more reasons why users choose ridesharing over traditional ground transportation. What’s clear is that the sharing economy is disrupting business as usual and these new time- and money-saving services are here to stay. What happens next is anyone’s guess, but rest assured, the team from Certify will continue to stay ahead of the trends that matter most to business travelers.